22 July 2016, Friday. I made it into Cambodia! After hearing all the horror stories of travellers getting turned back into Laos, or worse, getting stuck between borders in no-man’s land, I was a little worried about crossing this one. But then again, it wasn’t an easy experience, and I was almost turned back into Laos. As I only had 100,000kips (approx SGD17 or USD12) left on me, I decided to head to the little town of Nakasong to get some more Kips. 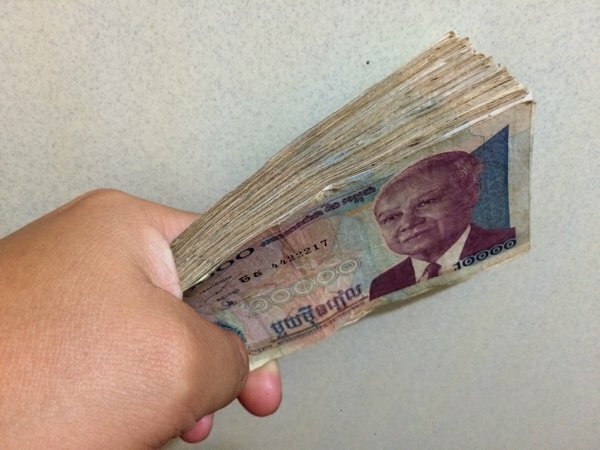 The border officials at the Laos-Cambodia border are notoriously corrupt, and I needed to make sure I had enough cash for their “service fee” or “donation” to make things move along. But before all that, I needed to get some stuff done on my bike. I asked the 2 motorcycle servicing shops in Nakasong if they sell motorcycle chains, as my current chain is showing some signs of uneven wear. No joy. It was also about 2,000km from my last oil change, and was about time to replace the oil (new engine EO change routine). The first shop refused to touch my bike, and even seem to tell me that he will sell me the engine oil, but I’ll have to replace it myself. Needless to say, I walked away. The 2nd shop was willing to do the engine oil change for me at no additional cost – other than the cost of the oil itself, which was 30,000kips per 0.8L bottle. So I got myself some new oil for the Pulsar. Oh oh. Not the news I’d like to hear. A local who lives so near the border seem to be confirming the reports I read online – crossing this border with a motorcycle will be problematic. So I went back to my room to pack my stuff, and was deciding if I should trod ahead or turn back around and head into Thailand at Pakse. I decided to give it a try anyway. Reached Laos’ Vuen Kham immigration. Asked the immigration officer if I could enter Cambodia. He instructed me to go over to Cambodia and asked them. If they allowed, then come back to Vuen Kham immigration to process the exit. Rode up to the Lao’s Vuen Kham border control barrier (approx 20m ahead). Told the Laos officer there that I’m going to ask the Cambodia’s officials if I could enter Cambodia. I stressed that I have not stamped my passport for exit at Laos’ immigration. If so, I will then turn back to exit Laos. He said okay, and allowed me through. 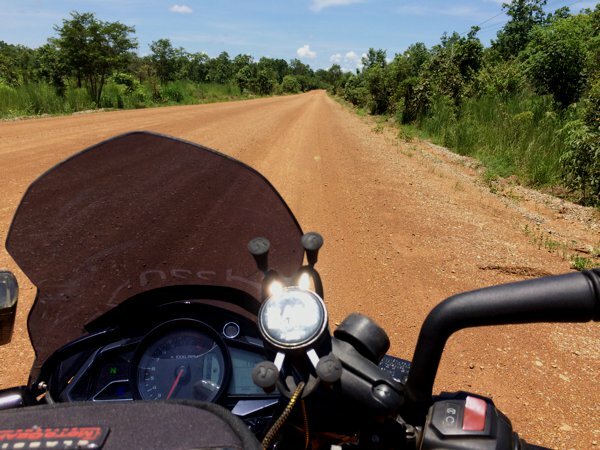 Rode up to Cambodia’s border control (approx 50m or so ahead). There is a tent on the left side for “Health and Quarantine Control”. I spoke to the guy there and he pointed me to the immigration box just across the road. Crossed the road, walked over to Cambodia’s immigration control, and asked them if I could come into Cambodia with my motorcycle. Again, I stressed that I’m enquiring and have NOT stamped out at Laos’ immigration. They asked me to check with customs first. Left my bike at the immigration / health and quarantine area, and walked over to customs (approx 50m ahead). This is the part where it gets a little tricky. Customs asked for my bike registration forms (they referred to it as the “green form” – possibly referring to the Thailand registration papers). I gave them a printout of my vehicle registration details and explained to them that in Singapore, the records are all kept electronically with the Land Transport Authority, and this is a printout of the electronic record. The customs guy was a young chap. He said that he needed to consult his boss, and handed the registration printout to him. His boss (the very much older chap) took a look at it and frowned. He said that to come into Cambodia, I needed to get prior permission from Phnom Penh. The customs officer then replied, saying that that may be the case for passport visa, but Singapore and Cambodia doesn’t have a land transport agreement. He said he could “make secret” with me, but was afraid that I might have trouble when I’m inside Cambodia. At this point, I was ready to turn back. I told him I was here as a tourist, and shared with him the route that I’ve travelled so far (Singapore – Malaysia – Thailand – Laos). I told him that while I would very much love to visit Cambodia, I didn’t want any troubles as a tourist and if it was gong to be difficult for him, I would had back to Laos, and then turn into Thailand and give Cambodia a miss. He then asked me which border I intended to exit from. 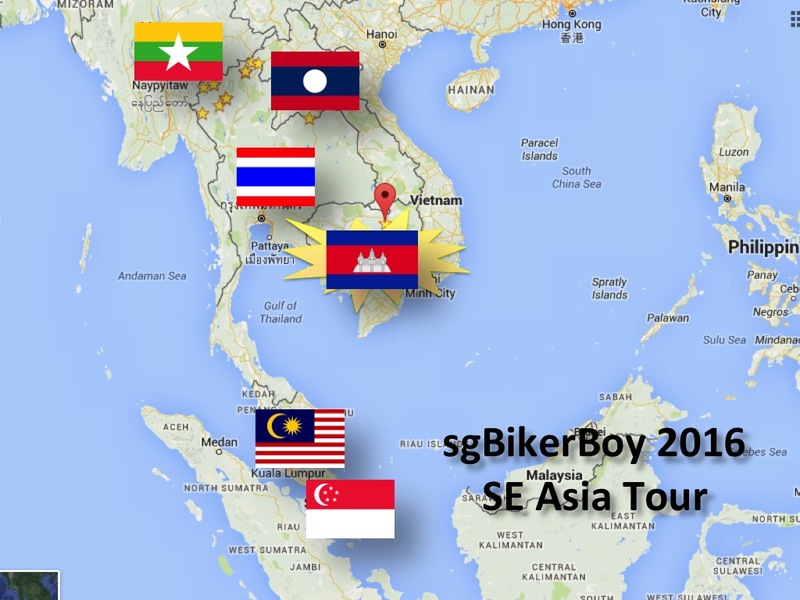 I showed him a map on my mobile phone GPS, and told him the route I intended to take (Stung Treng – Phnom Penh – Siam Reap) and planned to exit at Poi Pet towards Thailand. So with that final “go ahead” from Cambodia customs, I went back to Laos’ immigration, and started the process all over again. Cleared Laos’ immigration at the official immigration counter and got my passport exit stamp. Was asked a $2 / 20,000kip fee. Here, a tout stations himself with a table set up just in front of the immigration counter and claim to be able to assist with the passport paperwork. I’ve read that this is a scam. He’s neither immigration nor customs officer. Not even in uniform. But he speaks good english and seem to project himself as an official immigration representative. I saw several tourists handing their passports (and some money) to him. After immigration, I was directed to Customs just across the road. Handed the green form (customs temporary import of motorcycle form) to the officer there. That’s it! Wasn’t asked for any fee. Rode over to Cambodia side. Immigration officer asked me to head to Customs to get customs form and chop. Walked over to Cambodian Customs. The boss said no need for any forms, and called up the Immigration guy from his cellphone. He then said, “okay” and wished me luck. No fees asked! I was surprised! At this point, after all the walking about, I was extremely thirsty. So I bought 3 cans of drinks – 1 for myself and gave the 2 to the Customs officer and his boss. Walked back to Immigration and tried to get my passport stamped. By then the “Health and Quarantine” guy came up to me and asked me to head over to his tent. I’ve read that this “health check” is also a scam and not all necessary. But I complied anyway. While filling up the “health and quarantine” questionnaire, the “quarantine officer” noticed I had a helmet cam and asked me if it was a video camera. I told him that it was for recording of my travels. I think he got scared and didn’t ask me for a fee, gave me a “health advisory” slip and sent me off. I heard from some of the other tourists that they were asked for USD1. Walked back to immigration again. As I had a Singapore passport, I didn’t need a visa. So, thankfully, no visa fees. But I was asked for USD1 for the stamp on my passport. I should have given him USD1 or 10,000kips. Unfortunately, I didn’t have either, and ended up giving him 20,000kips (approx USD2.50). No change. Obviously. Approximate time to clear the border – just over 1hr. Partly due to the fact that 2 busloads of tourists arrived just as I was returning to Laos’ side to go through the exit procedures. 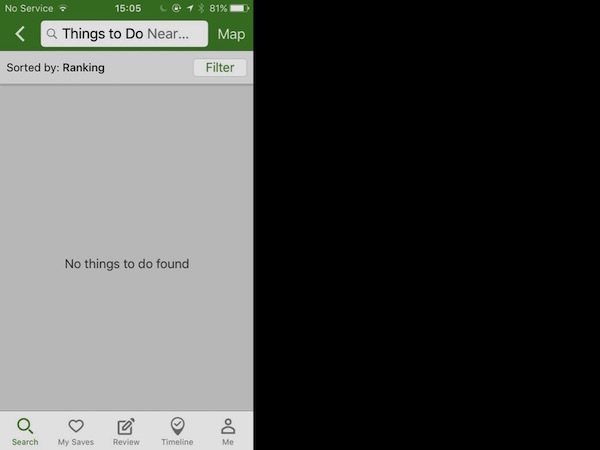 …and I thought that Laos’ roads were bad. It’s worse in Cambodia. 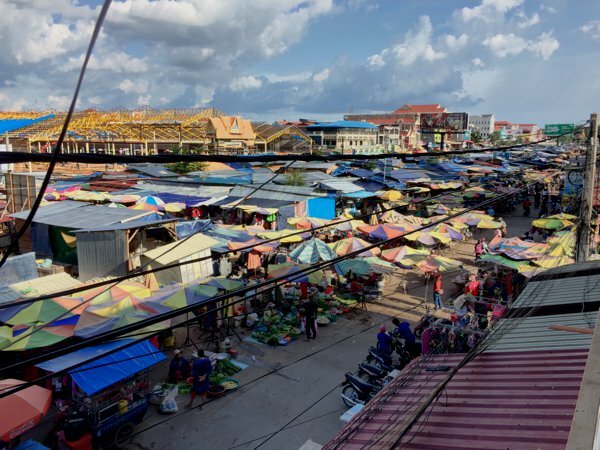 Headed to the town of Stung Treng – the nearest Cambodian town from the Laos-Cambodia border. It was slightly below an hour ride to town. Bought some Riel at the bank, got myself a room for the night, and new sim card with data plan – the usual drill when entering a new country. Oh, USD is accepted directly at most places, although I changed it to Riel’s at a slightly better than typical rate of 4,000R to 1USD. But my Laotian Kips were practically worthless here. They would sell Kips for 0.504 and buy them at 0.384. That’s a freaking wide spread!! Probably the 2 most useful currencies here (apart from Riel) would be USD and THB. Expect super lousy spreads for most other currencies. With a thick wad of notes, I feel quite rich. Until I realise each 10,000R piece is worth approx SGD3,31 or USD2.44 only. View from the 2nd level balcony of the hotel. Parked my bike in the hotel and went walking along the streets. I spotted almost no tourists. Although buzzing with locals, Stung Treng is very much untouched by tourism. Had dinner at a local restaurant – which was really difficult to find. It seem that the concept of eating out is not very popular here. And just after I finished me meal and paid up…. pop! The ENTIRE TOWN went black. Yup! Electrical blackout. THE WHOLE FREAKING TOWN! I think this is probably a typical experience, as I spotted some random spots of battery-powered lights in some of the more well-prepared shops. I took my time to walk back to my hotel. About a 5-10min walk. And just as I reached my hotel. Lights started coming back on. How much did you prepare for this trip? Im very much interested in riding up too. But mine is only r15. I brought along USD1,000 and a little bit of THB from my last trip. Definitely not enough. But withdrew at ATM machines in the various cities. My breakdown and engine rebuild in Chiang Mai cost me quite a bit – both in money and in time. I didn’t want to carry excessive cash too. Yes – the exchange rate for ATM withdrawals may not be great, and the banks charge some service fee. But that’s the price I was willing to pay for peace of mind of not having to carry too much cash. I swapped my last USD200 for Cambodian Riel earlier today. I still have some THB for the return trip into Thailand. Oh, and from a repairability point of view, the R15 is probably more suitable than my 200NS. Though much rarer than the kup chai’s, I recall seeing the R15 in Thailand and in Laos. So if you need parts, definitely easier to obtain compared to the 200NS.